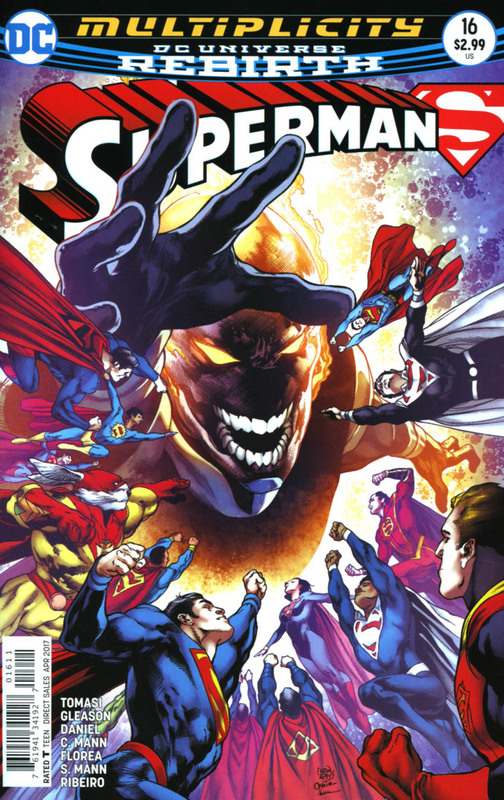 Prophecy has captured Superman, remarking that though he does have the powers of the Supermen and women of the multiverse he is an anomaly in existence. When questioned he retorts that doom is coming and that with the combined powers of the Supermen of all existence he will be able to save his world. He questions Superman on using the Ultima Thule as it seems to be nothing more than a musical instrument in the guise of a star cruiser. Superman shrugs it off and is then sentenced to dig a grave with the other powerless captive Superman for all his multiverse counterparts. The Justice League Incarnate realize that the Ultima Thule has been playing a tune non stop as a beacon to them. Red Racer then sets about building a second ship to launch a rescue mission but in his haste he pushes himself too far and he dies in the process. Meanwhile back in the grave Superman meets Super-Man and his other 'family' members and rallies their support to fight against Prophecy and all he stands for. As the new Ultima Thule arrives suddenly all the Supermen and women's powers come surging back. They fight furiously and realize Prophecy's right hand is a siphon and projector of power. They force him to discharge the Superman energy before cutting it off. Suddenly the villain is teleported away but at least all the heroes have survived and the JLI set about returning all the prisoners back to their respective dimensions. Kenan and Clark take the opportunity to get to know one another after keeping apart for so long. The two Supermen forge a friendship but as they do Mr Oz has captured and constrained Prophecy berating him for his attempt to subvert his mission. Prophecy failed and his fate is now... unknown. Story - 3: I enjoyed the issue and the themes of hope and inspiration. There were little hints at the future, Superman being deemed an anomaly in the multiverse throws more questions into the mix. The meeting between man and Super-Man was interesting though ultimately fruitless as unfortunately was the story in the end. It was enjoyable I loved all the nods to other Supermen, I enjoyed the message it was conveying and the seeds it sows revealing a tiny bit more of Mr Oz's master plan or at least its ultimate goal. I think the Justice League Incarnate is fantastic (They should keep Etrigan now they've lost Ray) they were a fun aspect that can live on after this arc and I hope we get to meet them again. My problem with the issue is the return of their powers. How did it happen? It was a breathtaking moment but it wasn't explained and wasn't revealed (unless I missed it) It's a massive story point so it really should have been made clearer. Art - 5: Lots of double page spreads, lots of stunning artwork. Tony S. Daniel & Clay Mann do a fantastic job rendering the Supermen & women of the multiverse battling it out against the mysterious Prophecy. That last page was extremely dark and with all the light and hope it created a sense of dread. Some of the inking towards the end changes in style and pace to keep up but it also matches the pace of things so Seth Mann should definitely get a shout out. Cover Art - 5: What an awesome cover! I found myself double checking a who's who to identify all the Superheroes and that made it just as much fun as it was cool. I really like the composition and the perspective works. Ivan Reis has been providing some stellar cover art across the DCU lately and this I feel is perhaps his best so far. 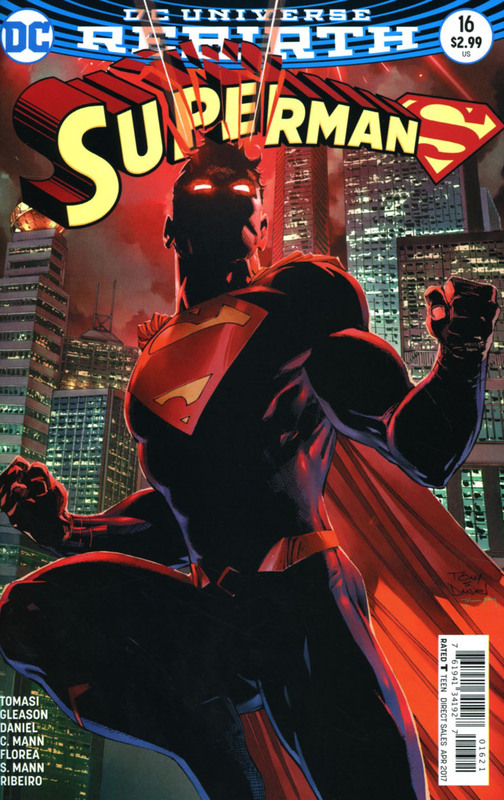 Variant Cover Art - 3: The mean moody Superman doesn't really fit with the story inside. The explosive laser thing works for Cyclops, the darkness for Batman but coupled together and for a story all about inspiring hope this seems like an ill fit. A rare misstep for Daniel, but only because of the interior story, not the art itself.